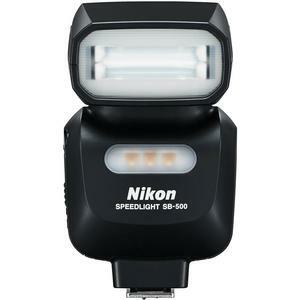 Portable and easy-to-use, the Nikon SB-500 AF Speedlight Flash & LED Video Light is compatible with Nikon DSLRs as well as specific COOLPIX cameras. With a compact, lightweight build, this flash unit makes it simple to manage the quality and direction of light. 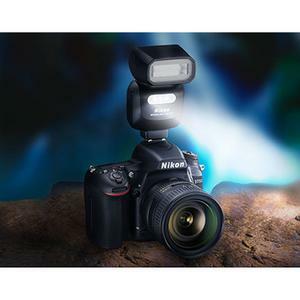 In a first for Nikon, this Speedlight features a high-intensity LED light on the front of the unit that is ideal for shooting movies, or capturing close-up still images. Compatible with the Nikon Creative Lighting System, the SB-500 also enables wireless control of multiple flash units. The SB-500 AF Speedlight has simple controls -- just a few buttons -- yet, it offers the performance of an advanced Speedlight. Its powerful and has wide coverage with a guide number of 24/78.7 (ISO 100, m/ft) with 24mm coverage in FX-format and 16mm coverage in DX-format. 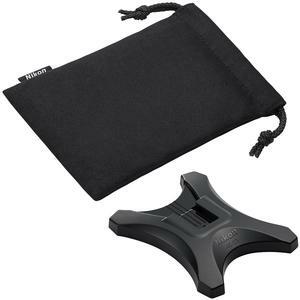 Its head rotates 180° left and right and tilts 90° upward allowing you to bounce light off nearby surfaces to soften the light and shadows, creating more flattering portraits. If your camera has a Commander Mode, it can even be used wirelessly off-camera along with your camera's built-in flash for greater illumination power from interesting angles. 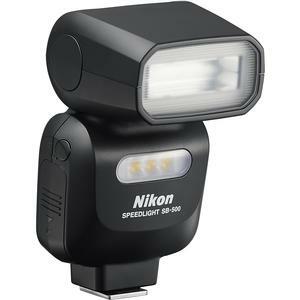 The SB-500 AF Speedlight is also a versatile video light especially well suited for recording interviews up close. It has a built-in high-intensity LED light (approx. 100 lux) that provides steady, uniform daylight-balanced illumination. It can be used at three output levels -- quarter, half or full power -- making it practical for low-light video shooting and close up still photography. And when used with the D810 or D750, the SB-500 AF Speedlight communicates LED color information (along with that of the flash) to the camera for optimal white balance. Compatible with FX- and DX- format DSLRs, COOLPIX cameras equipped with a hot shoe, and the Nikon Creative Lighting System. Superior ergonomics matched with easy-to-understand controls on the rear of the unit. Additional functions and flash mode can be set via a camera menu, which activates automatically when the SB-500 is attached to the camera. Powered by just 2 AA-size batteries. Flash head tilts up to 90° and rotates horizontally through 180°. 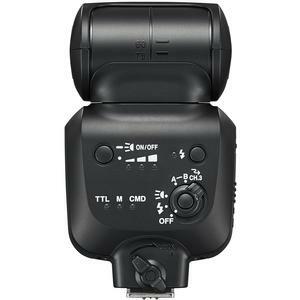 Works as a master flash for multiple off-camera flash set-ups, when used with cameras featuring a built-in flash commander mode.